SOUTHBURY, Conn. – When tornadoes ripped through Connecticut this May, they left chaos in their wake. Thousands of homeowners were left with downed trees, debris and nowhere to turn for help. In the midst of such devastation, teams of volunteers from across the country stepped up to assist in recovery. One of those teams was a group of Missouri Baptist Disaster Relief’s collegiate interns. 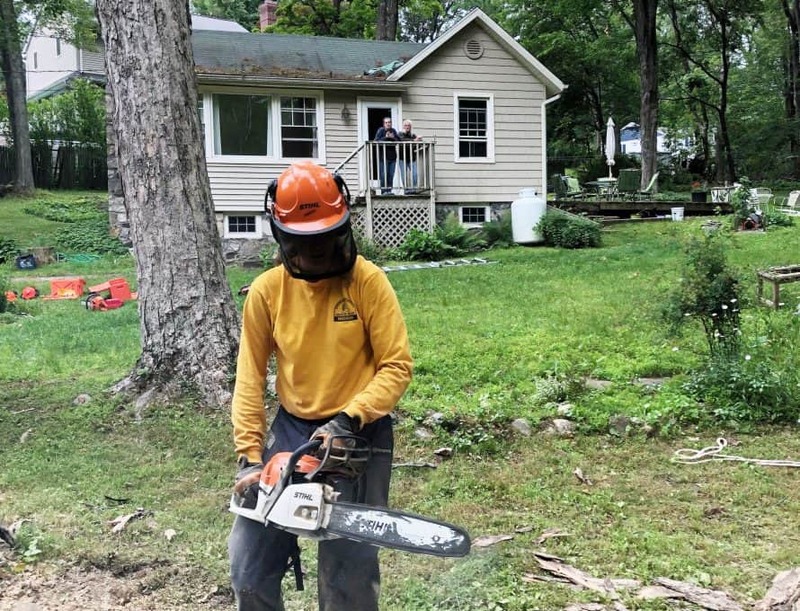 Armed with a chainsaw, a wood chipper and the Word of God, DR volunteers provide hope, healing and a strong witness to those affected by disasters. The collegiate intern team spent most of their time cutting up fallen trees, clearing brush and removing remnants of the storms. The hours spent with a chainsaw and a wood chipper were long, loud and grueling. But their knowledge of disaster relief methods helped them to make connections with various homeowners. One of the homeowners the collegiate team assisted was a woman named Samantha. According to Collegiate Disaster Relief Coordinator Joe Banderman, when they arrived Samantha had 39 downed trees in her yard. He and his team cleared the debris as best they could, and the results had a profound impact on Samantha. The opportunity that Banderman and his team had to witness to Samantha is part of what makes DR such a special ministry. Armed with a chipper and a chainsaw, the DR teams are uniquely positioned to reach hearts for Christ. DR intern Erin Pearson, 23, has seen firsthand how DR opens doors for witness and testimony. The work done by Missouri Baptist DR is funded entirely through the support of Missouri Baptists, which means the homeowners are given assistance for free. According to Pearson, that fact often creates confusion. The DR volunteers take full advantage of those open doors. According to DR intern Riley Elliot, 21, the team attempts to pray with each homeowner they work with. And after every job, they give the homeowner a Bible signed by each member of the team. One such Bible made a huge impact with one of the homeowners – a World War II veteran named Nick. According to Pearson, Nick was overjoyed at receiving his Bible. So much so that he didn’t want to let it go. During their time in Connecticut, the DR collegiate team made connections and developed relationships with believers and non-believers alike. However, there comes a time in every trip where they have to go home – even if that means leaving behind homeowners that have not yet made a decision to follow Christ. For the members of the DR collegiate team, their time in Connecticut was a blessing – not only because they were able to help others, but also because they ended up being blessed as well. Each member of the team learned something through their time with DR. For Elliot, DR has helped her in her walk with Christ. Pearson, too, has grown in her faith as a result of her involvement in DR.
After two weeks of working hard and sharing the gospel in Connecticut, the DR collegiate team returned to Missouri emotionally and physically wrung out. Banderman came back to Missouri tired and thankful for the resources available. At the time of publication, the DR collegiate intern team is in Texas, working to assist homeowners who have experienced flooding from the Rio Grande. Banderman asks for prayer for his team, so that they may stay safe and share the gospel far and wide.